Wi-Fi Password Recovery is the top utility for hacking wireless password, which enables to recover the forgotten WEP and WPA/WPA2 passwords of network easily. Here is the detailed instruction on how to use Wi-Fi Password Recovery to crack wireless network password. 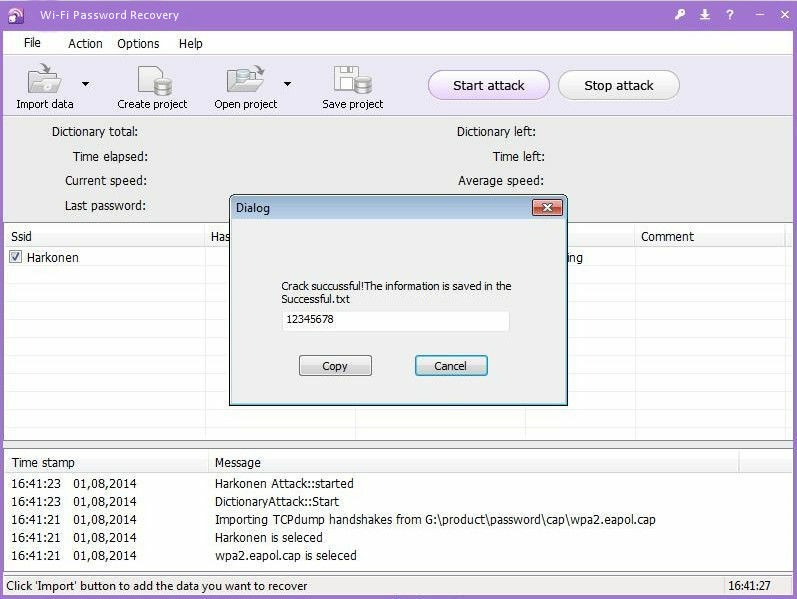 First, you should download and install this Wireless Password Recovery tool on your PC. Import data: Launch Wi-Fi Password Recovery. Click "Import data", and 2 options you can choose to load your Wi-Fi data. Import TCPDUMP file: Provided that you have captured the packages, you can choose to import the packages to attack the Wi-Fi password. Add WPAPSK Hash Manually: If you have SSID and the WPA-PSK password hashes from non-working operating systems, you probably can choose this option. Alternatively, you can click "Open project" and find the resumed results saved by the "Save project". Then you can continue to recover the wireless password. Note: Create project: If the imported files are wrong or not needed, click "Create project" to create a new project to cover the previous data. Step 2. Select an Attack Type and Start Attack. 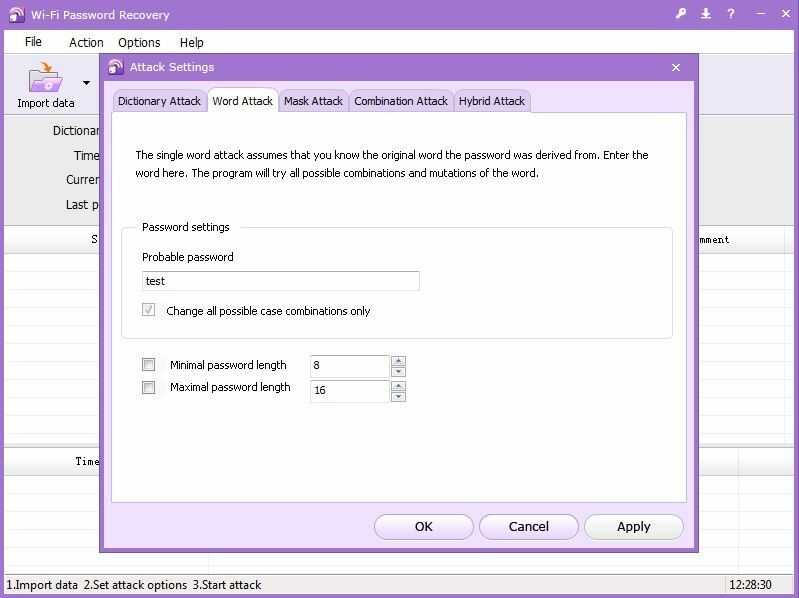 After loading file into the software, click "Start attack" and 5 types of attack will in the drop-downlist: Dictionary Attack, Word Attack, Mask Attack, Combination Attack, Hybrid Attack. 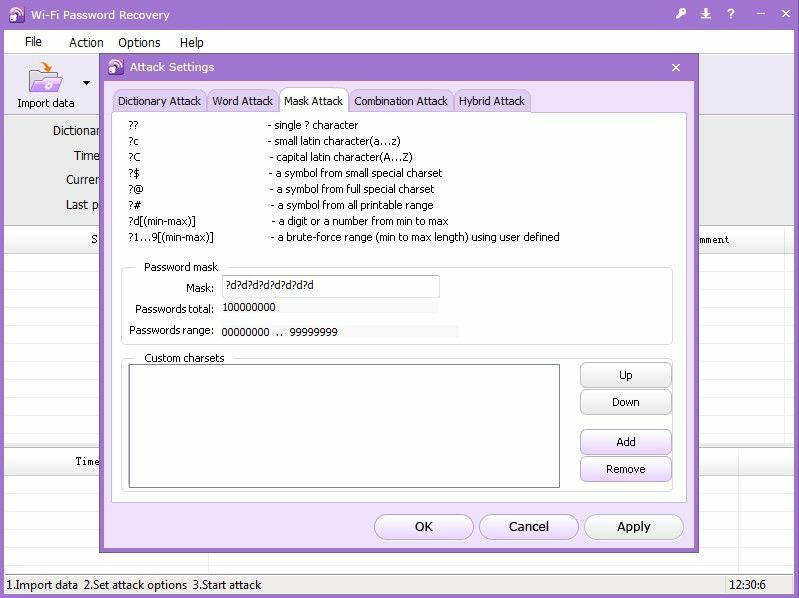 Every attack type has its requirements and limitation, and you can select the most suitable one to effectively and correctly attack the WiFi password. Dictionary Attack is the most recommended option. You can import an integrated dictionary included within this software, or you can import the one you provide. If you like to define the setting, you can go to Options > Attack Option to bring out the Attack Settings. In Attack Settings, press "Add" to add dictionary file(s) to the list, or press "Remove" to remove the selected one(s), or press "Up"/"Down" to change an order. Moreover, you can also set "Ignore password if it is shorter than 8 or longer than 64 characters"; with it, the program will only check those passwords in following limit: min 8 and max 64 characters. This type of attack tries all possible variations of the given word, applying even more mutations than in Dictionary Attack with maximize efficiency option. Enter the original word in the Attack Settings. If you can still remember part of your password, you can use this type. For example, if you remember your password is 10 characters and begins with "a", then you can define the mask as "a?????????" in Attack Settings. With the Mask Attack, you can check for passwords with the known/complex structure. This attack type generates all possible two-word password combinations from input dictionaries. You can also go to the Attack Settings to select the dictionaries in Dictionary 1 and Dictionary 2 fields, set additional options to check lower and upper case combination, word delimiters, perform extra mutation for output passwords. This attack is similar to Dictionary Attack described above, but all mutations are set by the user. Here you can select one or more dictionaries (wordlists), as well as several mutation rules. The rules are set in *.rul files. Note:Save project:During the password recovery procedure, if you want to suspend or pause the recovery, you can click "Save project" to save the recovery process and information. 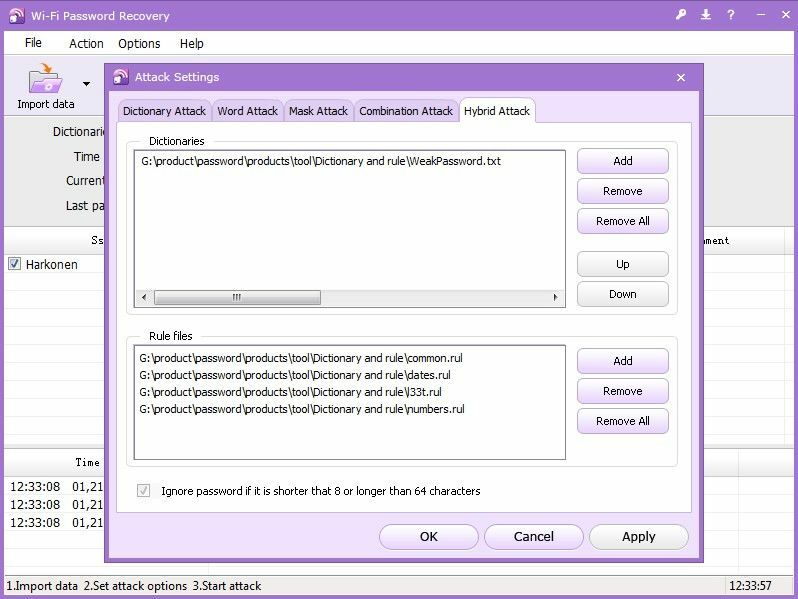 During the recovery process, the tool will present the state-of-the-art in password recovery, including dictionary, time, speed, password, and processor load. Once if the recovery is successful, the password information including SSID, Hash number, and password will be automatically saved in the Successful .txt (you can find the file in the directory of executive program). Alternatively, you copy the key directly. Need to crack forgotten WiFi password, get Wi-Fi Password Recovery right now. Sounds Good? Get " Wi-Fi Password Recovery " Now!